So – you got this Amazon Alexa device at Cyber-Monday? And maybe a connected “smart” plug or light bulb? Before you start adding more “smart” stuff – here’s what you need to know. I am going to use some technical terms, but don’t be afraid. Those are really simple ones like “wake word” or “bridge server”. And I’ll explain them of course. Let’s get started. A voice controller like “Google Home” or “Alexa” let’s you do a lot of things. You can ask for news or weather, you can actually chat with some robots, call people on other devices or on the phone, play games, there are hundreds of “skills” – that’s what Amazon call apps – to explore. You can even order p izza or other products from the Amazon store – thought this is a bit awkward. You can set timers and reminders and play music or videos. I have Amazon “Prime” and that allows me to listen to songs just by telling “Alexa” what I want to hear. But the “Prime” repertoire is somewhat limited and “Alexa” reminds me quite often that I could have access to much more music by subscribing to Amazon’s own music service – for an additional fee of course. If you have “Spotify” you can link “Alexa” – but I don’t have that either. And .. of course .. “Alexa” enables you to control an “Amazon Firestick” – a little device you can plug into your TV to watch video. And you can control lights or other stuff via voice. 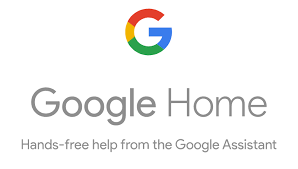 The “Alexa” or “Google Home” base units are pretty much mini computers with a microphone. Actually – a microphone array as they have microphones that can listen in any direction and are specialized on “far field” listening – that is, they are able to distinguish voice from noise even from some distance away. The little computer inside the unit listens to everything that’s going on in your room, but it is usually not recorded or transmitted. However .. the moment the unit detects the “wake word” – like “Alexa” or “Ok Google” it actually starts to transmit everything to the company server. Even if the wake word was detected wrongly (which happens) or someone on TV or your parrot says it (happens too), the unit listens, records and transmit everything for a number of seconds. Let’s say you want to switch the light on. You turn to your device and say the wake word – “Alexa” – and continue with “switch the light on”. 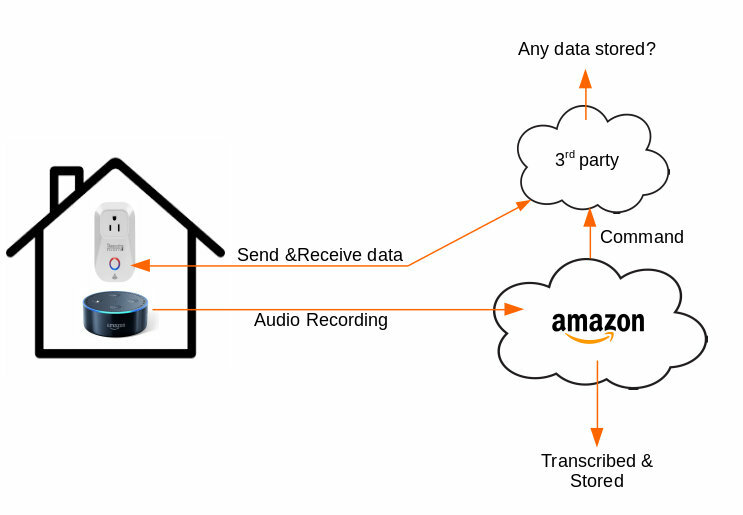 The unit sends the recording of your voice to Amazon where it is interpreted and stored. If you say something – like “Alexa – I want chicken wings” – or anything else – it may not be interpreted into some action, but it is transcribed (turned into written words) and stored. So – you want to be careful with what you say. Back to “lights on”. Amazon’s computers have figured out correctly (that’s not always the case) that you want to switch your light on. Based on your settings, it looks through it’s database to find something you configured as “light” tied to your account. If you have a “smart” plug and named it “light” during the setup, that’s what Amazon is going to switch on. But usually not directly. Your WiFi router won’t allow direct access to any device behind it. Amazon has no way to directly contact it. This is the reason those “smart plug” or other connected devices manufacturers want you to install an app. Because they are running “bridging” servers themselves. The “smart” devices are connected to those bridging servers and Amazon knows how to contact those intermediaries. Just to make that point clear: Your $10 “smart” plug has your WiFi password and can listen into your network traffic. It also maintains a data connection to a third party server you don’t know a lot about and that is most likely run by a foreign company. Are those units “spying” on you? Who knows. Voice controlled units are fun. At least for a while. Controlling your lights, your TV or your a/c is really comfortable. But it comes with a price. And I am not talking about the purchase price. The need to use 3rd party “bridge services” is of some concern. You may be willing to entrust Amazon or Google with your data. But what about those foreign companies and their philosophy of “privacy”? What happens if those companies decide they don’t want to provide those bridge-servers anymore? Your “smart” devices are suddenly dumb as a brick. The same happens of course if your Internet goes down. In January 2013, it was revealed that some WiFi “smart” device brand had a security flaw that allowed an unauthorized user to take control of a switch. This could allow malicious attacks, such as flipping the switch at a very fast rate, which could damage certain devices and even cause electrical fires. Any way we can mitigate those problems? It depends. There are “smart” plugs and other devices that don’t require WiFi but talk different protocols (ZigBee, SmartWave). They require a hub (though the new Alexa Echo Plus comes with a ZigBee hub). But since those “hubs” again need to talk to your WiFi network, the problem has moved from the “smart” devices to the hub-device. Unless you have your “Echo Plus” control those devices. You can (and should) isolate your Wifi connected “smart” devices from the rest of your network. That’s pretty easy and can be done in half an hour or less. Though I like to work with voice controlled environments (I actually built my own Alexa device) – it’s not ready for the mass market yet. The environments are just not flexible enough, there’s no privacy, you can’t combine (group) different skills and, quite frankly, the voice gets on your nerves sooner or later. You may have noticed that I put the word “smart” in quotes. Because those devices, including Alexa or Google Home, are not smart. They just try to follow a basic set of rules and that’s pretty much it. So – if you want to try it out – by all means – get yourself a dot for $30 and maybe a “smart” plug for another $15. Play around with it. Have fun for a while. But don’t expect too much. And if it starts to bother you – you can always switch it off. There is no reason why voice control has to be running in some cloud.There is the “Jasper” environment that enables you to run your very own voice controlled environment. Without Alexa, Google or Apple. Even more exciting is the fact that the Mozilla foundation is working on a Speech-To-Text technology that rivals those developed by the big guys. It should be available soon. And yes – I have “hacked” those WiFi controlled “smart” devices so that they won’t call home any more. In other words – we will have those technologies available without sacrificing our privacy very soon. Stay tuned.